Caroline Crawford said benefit changes for new employees won’t affect current funding. 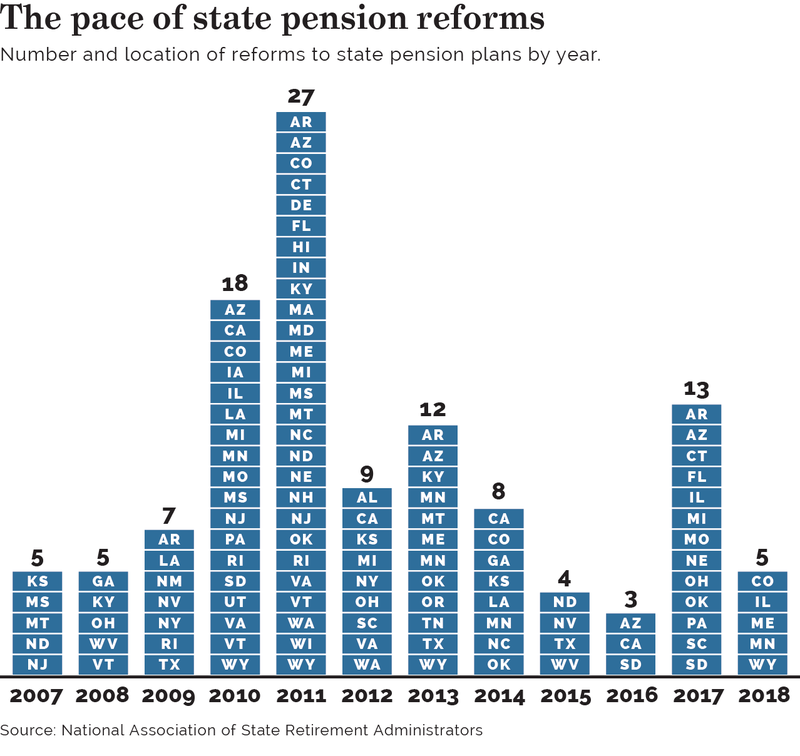 One of the many dramatic effects of the Great Recession was an unprecedented amount of public pension reform activity that is just now starting to ebb. After state and local pension fund assets plummeted to $2.17 trillion in March 2009 from $3.15 trillion at the end of 2007 and the governments' own coffers took a hit, policymakers began looking hard at ways to manage rising pension costs, according to a December report from the National Association of State Retirement Administrators. The report found nearly every state passing "meaningful" reform for one or more of its pension plans. "States have always made reforms, but what was untypical was the magnitude," said Alex Brown, the Washington-based research manager for NASRA. The number of states enacting pension reforms skyrocketed to 27 in 2011, up from five in 2007, NASRA found. In 2016, reforms were enacted by three states, then spiked again to 13 in 2017, falling once again to just five last year. So far in 2019, just a few states are actively discussing reforms. In Kentucky, a legislative working group is reviewing the pension systems for possible changes after the Kentucky Supreme Court in December struck down on procedural grounds a pension reform bill signed into law in April. The law enrolled new teachers into a cash balance plan and reset the 30-year amortization period to pay off the unfunded liabilities of the $17.4 billion Kentucky Retirement System, Frankfort, among other changes. Georgia legislators will soon have pension reform proposals to consider, following an audit showing potential cost savings from plan design changes for teachers' pensions and cost-cutting measures at the $16 billion Employees' Retirement System of Georgia, Atlanta. In New Mexico, legislators will be working on a pension solvency plan with input from the board of the $15.5 billion New Mexico Public Employees Retirement Association, Santa Fe, which in December recommended increasing contributions from employees and employers, plus temporarily suspending and later reducing cost-of-living increases. Another recent concept is mandated stress-testing of public pension funds to help policymakers prepare for the next economic downturn. While public plan actuaries have always done stress-testing or similar modeling, Greg Mennis, director of public sector retirement systems for Pew Charitable Trusts in Washington, is seeing the idea of formal, annual stress-testing gain traction. California and Washington state were joined in recent years by Connecticut, Colorado, Hawaii, New Jersey and Virginia, where legislation dictates it. A study of reform activity through 2014 by the Center for Retirement Research at Boston College found that since the financial crisis, 74% of state plans and 57% of large local plans have cut benefits or raised employee contributions to curb rising costs. Plans most likely to enact changes were those with a larger cost burden and lower initial employee contributions. States with the strongest legal protections for worker benefits were more likely to limit the cuts to new hires. "That's been the main lever that plans can use, although it is important to note that it is not going to have an impact on current funding," said Caroline Crawford, the center's assistant director of state and local research. Still, nearly one-quarter of plans have made changes impacting current employees. The most common change has been cutting cost-of-living increases, some of which were overturned in state courts. Legal challenges were a common reaction to half of the states enacting reforms, according to NASRA, which found that, "in many cases, what was upheld in one state was struck down in another." Increased employee contributions upheld in Florida were found illegal in Arizona, for example. Colorado's reduced cost-of-living formula was found constitutional, while Oregon's was not. Constitutional challenges to pension changes typically cite clauses on contracts or takings. The first clause prevents a state from impairing contractual obligations, and the second prohibits takings of property without legal due process. Other common reforms increased age and service requirements, with 33 states increasing the retirement age, years of service requirement or a combination of both, according to NASRA. Eight states — Arizona, Connecticut, Michigan, Pennsylvania, Rhode Island, Tennessee, Utah and Virginia — have created hybrid plans since 2009 for new or existing employees. Kansas and Kentucky created cash balance plans for new hires. Another trend that appears here to stay is more risk sharing with employees. NASRA found that 23 states have added one or more risk-sharing feature since 2009, ranging from hybrid plans to variable contribution rates and benefits that are subject to change if investment performance or funding levels dip. "In recent years we've seen plans take on additional risk sharing, and in some cases, they are adjusted without being subject to the legislative process," said Mr. Brown. While increasing employee contributions or trimming benefits is not a new concept, "now it is disclosed upfront," he said. Employees "have effectively learned that they were bearing some of the risk." Nine states increased the vesting period for new employees to 10 years from five, although two — Missouri and North Carolina — later reversed that after the savings did not materialize and workforce conflicts arose. The workforce issues related to pension reforms are now coming into focus. A Center for Retirement Research study of how pension reforms from 2005 to 2014 affected state and local government competitiveness in the labor market found that implementing the reforms hampered governments' ability to attract new employees. Retention is also "a very significant piece" of the conversation, said Diane Oakley, executive director of the National Institute on Retirement Security in Washington. A NIRS study of pension reforms from 2008 to 2013 concluded that adjusting defined benefit plans is more cost efficient than shifting to defined contribution accounts for new hires that would either increase costs to keep benefit levels or lead to bigger benefit reductions. As state and local governments now experience more retiring employees in an overall tight labor market, that is something to watch, said Joshua Franzel, president and CEO of the Center for State and Local Government Excellence in Washington, an organization that helps state and local governments attract and retain public servants. "The pension reforms that have been implemented in the wake of the Great Recession … certainly have impacted their ability to recruit vs. the private sector," he said. For those and other reasons, said Mr. Franzel, "I see us entering into a period of reduced benefit reforms, and letting a lot of the reforms play out. A lot of plan sponsors will see how their effects will play out from a financial and workforce management perspective." Another "new normal" that CSLGE found in a 2018 snapshot of 180 public plans' investment data is that a decline in funding ratios since the recession appears to be leveling off, in part because many plans are doing more to improve them, maintaining their annual contributions or even increasing them. Many states are also being more conservative about their investment or mortality assumptions, noted Gerald Young, senior research associate at the center. "There's no reason to think that funding levels will dip lower. Things are leveling out." According to CSLGE's 2018 snapshot, state and local pension average funding ratios that were 102.1% in 2001 starting falling until 2007, when they saw a slight increase to 86.5%. In 2008, they started dipping again, with modest increases in 2014 and 2015 before leveling off in the last two years, reaching 71.6% in 2017. The snapshot is based on comprehensive annual financial reports and assessed values as of June 2018. Bridget Early, executive director of the National Public Pension Coalition, Washington, agrees that things are stabilizing. "What we are looking at are state governments that are in a better place than they were pre- and post-recession, where (the pension) line items on budgets aren't as terrifying as they have been for a long time." Still, she said, "pension funding is a 30-year equation, and budgeting is a year-by-year item." Her advice for policymakers considering further reforms is to learn from states like Minnesota, where 2018 reforms that cut assumed rates of return, lowered cost-of-living adjustments and increased employee contributions won bipartisan support after all stakeholders were brought to the table. "It was a very inclusive process," Ms. Early said.